Within our collections we have some amazing objects and paintings. Some of them are extremely detailed artworks, some are finely crafted pieces of machinery and some are tiny and fragile sculptures or carvings. Unfortunately, the details that make these objects so interesting also make it impossible to get up close to them. The Blashka Models wouldn’t last long if everyone could pick them up and play with them. This is where digital media comes in extremely useful – we can display pieces in ways that weren’t previously possible and give people access to the most microscopic details. We have been using a technology called Seadragon developed by Microsoft. You might be familiar with similar technology in Google Maps where you can drag the image around and zoom in to see more detail. Seadragon allows us to do the same thing with images. 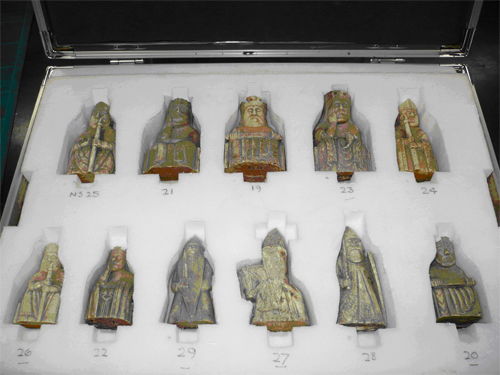 Last year, we used the technology to present some of the Lewis Chessmen. Here, we can zoom right in on the tiniest toolmarks and really get a feel for the craftsman that produced the piece. This is as close as it is possible to get without actually picking it up and squinting through a magnifying glass! 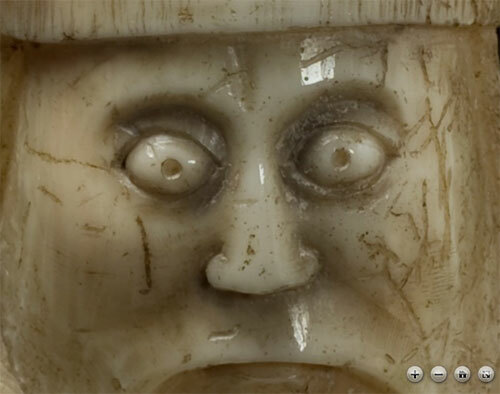 Here, Seadragon technology allows you to zoom and see the Lewis Chessmen in great detail. While working with the Seadragon library, we have found we needed to tweak the code behind the scenes a bit. One aspect in particular we’ve worked on is ‘hotspots’. When you use the software to create your zoomable image, you can draw certain areas on top into which you can add extra information – pointing out to the viewer where a particular feature is; identifying a person in an image. This information is, unfortunately, only accessible to the viewer if the image is displayed using Microsoft Silverlight, a technology like Adobe Flash which requires the user to install extra software into their browser. We wanted to avoid this requirement and so we embedded the images using Seadragon AJAX which only uses the technology built into browsers. This method, though, has no support for the hotspots. Internally, we have developed a tool which will allow the person creating the zoomable image to embed hotspots which are then accessible via AJAX – the best of both worlds. The embedded AJAX hotspots are visible in this new addition to our website – a detailed image of the painting The Storming of Tel-el-Kebir by Alphonse Marie de Neuville. 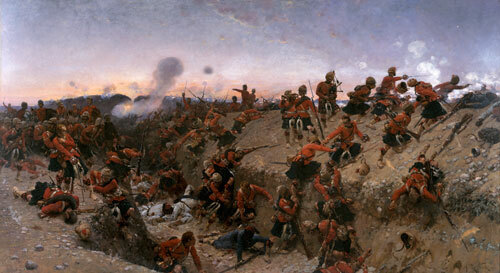 The Storming of Tel-el-Kebir by Alphonse Marie de Neuville. We have annotated the image with the names of some of the soldiers who are actually depicted fighting in this battle. If any developers would like to use this tool, we have made the code available on GitHub – an online source-code repository. Full technical details are available in the ReadMe within the project. The project is hosted here and can be downloaded here. Under our National Partnerships Strategy (2006-2011) we developed four strategic partnerships. These relationships have benefitted National Museums Scotland and all partners to build confidence around lending, exhibitions and sharing skills, as well as informing future models for working in partnership across the museum sector in Scotland. Being mainly front-of-house, Isabel and I are very rarely released from behind our desks in the galleries of Museum nan Eilean, Stornoway. However, on 30 November we broke free and headed to Stornoway airport, bound for a one day course on Object Handling at National Museums Scotland as part of the Knowledge Exchange Programme…. except our flight was cancelled due to snow in Edinburgh. ‘How bad can it really be?” we wondered as we headed back to our desks. VERY bad. Over the next five days our flights were re-booked, cancelled, re-booked, cancelled many times but finally an opportunity presented itself and we were able to land in Edinburgh, all set for some intense training (and a bit of light Christmas shopping)*. 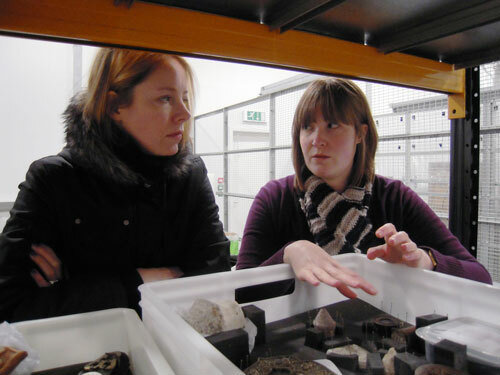 Although the original course had been snowed off the day before, Megan Combe, National Partnerships Officer at National Museums Scotland, made a heroic effort to ensure that our time in Edinburgh wouldn’t be wasted and that we would be able to visit the National Museums Collections Centre in Granton to have condensed training with members of the Collections Care team. However, with the weather still conspiring against us and Edinburgh’s roads and transport network ground to an unprecedented halt, the trip to Granton was inevitably cancelled. Undeterred, Megan made another round of phone calls and arranged for us to meet a number of staff members who were able to advise us on a variety of things. It was great to be behind the scenes at National Museums Scotland and to finally meet people that we’ve emailed or spoken to on the phone over recent months. 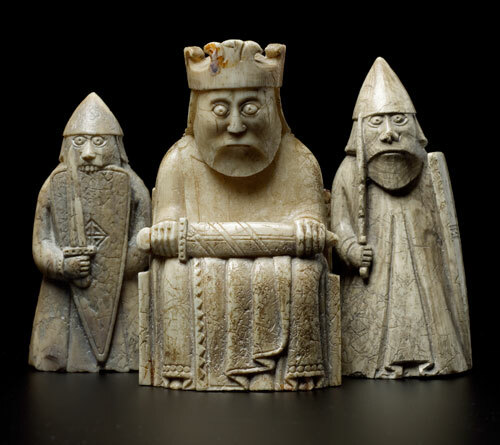 With the upcoming tour of the Lewis Chessmen arriving at Museum nan Eilean in April we had a lot of questions to ask about environmental conditions, treasure trove, loan conditions, marketing and facilities reports, amongst others, but we left reassured and feeling very knowledgeable! In advance of the Chessmen tour we needed to decant one of our galleries and so it was great to spend time with Sarah Brown, Collections Care Officer, who shared her expertise on the latest techniques and best practices of handling and packing a variety of artefacts. More importantly, Sarah instructed us in the fine art of making a variety of doughnuts and sausage shapes with acid-free tissue paper! 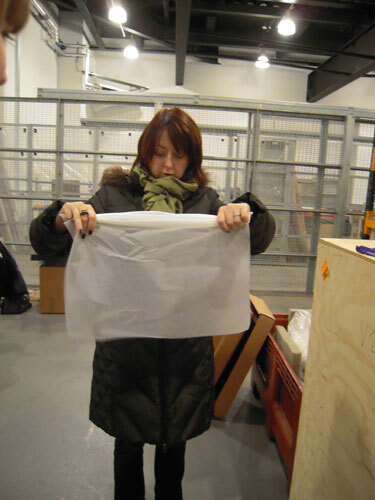 Sarah demonstrates techniques for packing textiles. 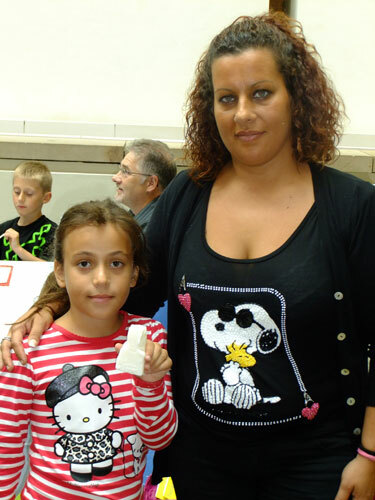 Isabel creates a tissue sausage. We were able to put into practice what Sarah had taught us as we decanted our upper gallery over January and February, with the help of our colleague Caitriona Maccuish (who was able to use the guidance material from Sarah) and some National Museums Scotland supermen Stuart and Stevie, who made the long journey north in January to pass on their case building expertise (“just gi’e it a guid dunt”). Ashley and Sarah discuss decant options. Having the training with the National Museums in Edinburgh made a huge difference to how we approached the decant and we were a lot more confident when handling artefacts, particularly the textiles, because of it. Without exception all the staff we met were welcoming and generous with their time and advice – and both Isabel and I really appreciated the chance to meet everyone in person. We were disappointed not to make it to the Collections Centre as it sounds amazing but maybe next time! Many thanks to Megan who went out of her way to make sure that we got as much out our trip as possible, despite the very trying circumstances (not only the snow but transport problems, power cuts and the lack of heating!). She even baked cakes for us! * We didn’t get any Christmas shopping done because the shops closed early due to the snow. Thankfully however, not even the snow could prevent the determined duo from their bottle of ‘warming’ Prosecco in the Dome! 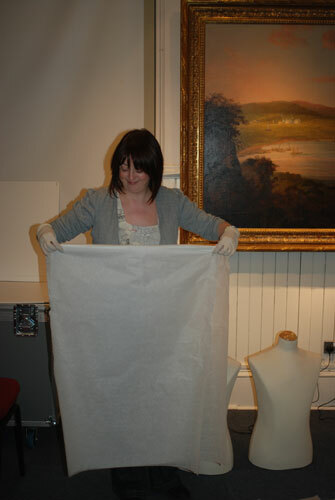 Back at Museum nan Eilean, Ashley demonstrates the textile packing techniques she learned from Sarah. Isabel demonstrates her tissue puff making skills. What exactly goes on behind the scenes of a project like the touring Chessmen exhibition? There are many teams in many departments working hard to make sure the exhibition is of the highest quality in terms of design, activities, publications, choosing what objects will be on display and what is written about them. 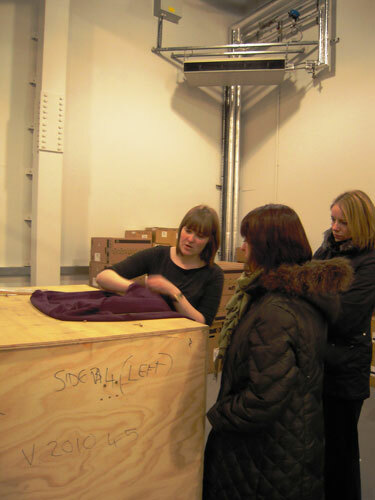 Here in the Loans section we have the job of making sure that everything is in place both at National Museums Scotland and at the receiving venue to ensure the objects are safe and well cared for once they start their journey on tour. For the chessmen, this involves liaising with venues in Aberdeen, Shetland and Stornoway. When a venue asks to borrow from our collections it sets in motion many activities. The job of the Loans section is to co-ordinate all of the many people involved in making a loan happen. Firstly we must ensure the borrowing venue is safe both in terms of security and environmentally. Many of our collections are sensitive to light, temperature or relative humidity and would be damaged if not kept in the correct conditions. Once a venue is approved and the objects requested are not required elsewhere, we ask our colleagues in Conservation to assess if the objects need any conservation work before they are packed. Condition reports are written too so that the objects can be checked regularly for any damage or changes in condition. Then the objects are packed according to how they will travel – for the Chessmen this means their very own nice cosy travelling case. 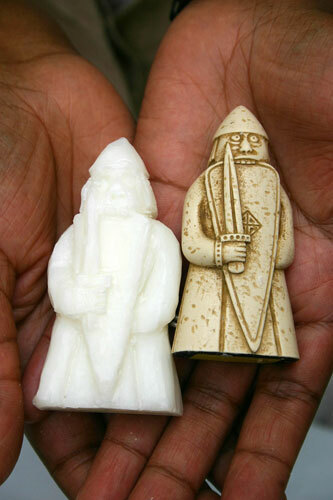 Some of the Lewis Chessmen ready to travel! Once packed and all the paperwork for insurance and loan agreements has been organised the transport must be arranged. Depending on the loan this could be a large truck or small van, or for overseas travel, a boat or an aeroplane. 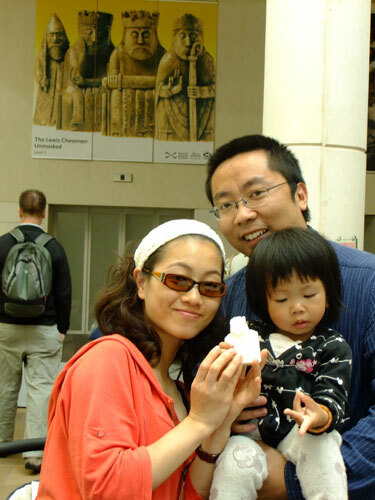 Mark Hall worked with National Museums Scotland on The Lewis Chessmen: Unmasked exhibition. Here he talks about his lifelong fascination with the Lewis pieces. It has been one of my almost constant delights over the past five years to get to know the Lewis chessmen better through my joint research of them with David Caldwell of National Museums Scotland. 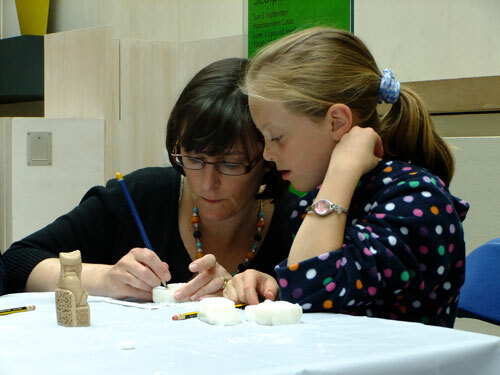 One of the great strengths of the Perth Museum collections is the finds from the numerous excavations of medieval sites on which the town is built. These finds include a splendid group of gaming objects, including a fourteenth century jet chess bishop from the Meal Vennel excavations. Jet chess bishop from Perth Museum & Art Gallery. 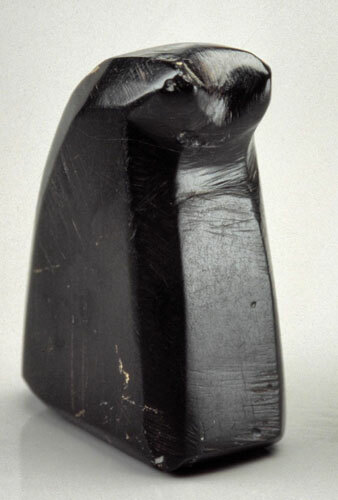 My interest in such objects and their use in Perth lead me to a closer look at chess in medieval Scotland, and so inevitably to the Lewis pieces. In reality, the Lewis pieces have been of almost life-long fascination to me: seeing them as a teenager was perhaps the highlight of my first trip to the British Museum and seeing them again many years later, joined by their fellows from the National Museum of Scotland for a special exhibition on Lewis, re-fired my enthusiasm. 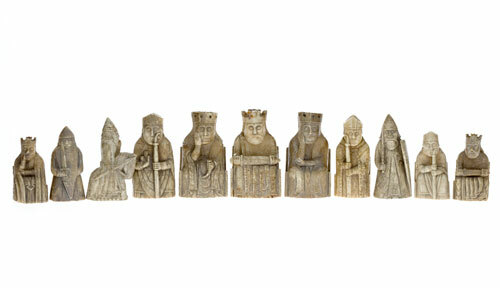 The Lewis chess pieces owned by National Museums Scotland. They are magnificent pieces that reveal something of the social complexity of play and feel imbued with a deep humanity. No matter how briefly gazed upon, they transport me immediately across time and space to a somewhat draughty and warmly-lit hall on Lewis, where they accumulated in part at least as gifts and perhaps in part as booty, and where they were used as the earnest playthings of adults, the less serious playthings of children and as talismanic watchers of the room(s) they furnished. 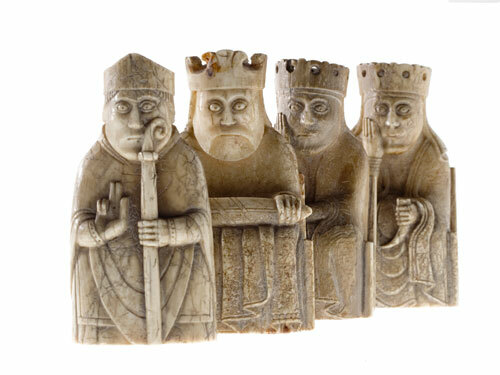 Three chessmen from the the National Museum of Scotland. The Lewis chess bishop and King and two Queens. The Lewis Chessmen: Unmasked by David H. Caldwell, Mark A. 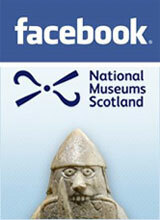 Hall and Caroline M. Wilkinson is available to buy in the National Museums Scotland online shop.